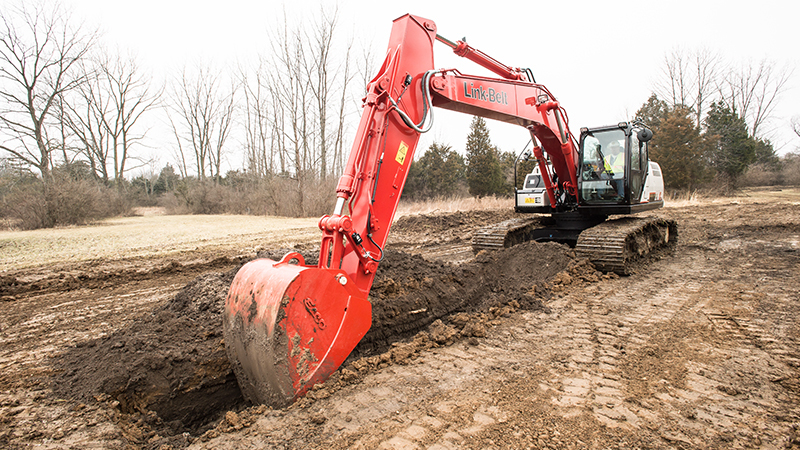 LBX Company announces two factory-installed grade control technology options for North American 210 X4 excavator customers. The Link-Belt® 2D Machine Guidance (MG) system provides an operator with visual and audible indication when they are above, below or at their desired target grade. The Link-Belt 2D Machine Control (MC) system provides the operator with not only visual and audible indication when they are above, below or at their target grade, but can also control the boom and bucket while the operator controls the speed of the stick to maintain a consistently smooth flat or sloping surface. 2D MG and 2D MC enable operators to increase their productivity by up to 50% by providing them with the information they need and the functionality they’ve never had before. The 2D MG monitor indicates the position of the attachment relative to the target grade at all times providing the operator the information he needs without relying on a grade checker. The operator can pick from two monitor modes. The Link-Belt 2D Machine Control (MC) system enables operators to dramatically improve their productivity and accuracy while reducing their mental fatigue by automating the movement of the boom and bucket to keep the bucket cutting edge on the desired target grade. 2D MC is ideal for applications like trenching for underground utilities or pipelines or anything that requires the last pass to perfectly match the desired target grade whether it’s a flat or sloping surface. The 2D MC system adds a 10” Android touchscreen display with an intuitive user interface and a machine control joystick in the cab to engage the semi-automatic boom and bucket control. Link-Belt 2D Machine Guidance and 2D Machine Control software, systems and components are designed and built to conform to the manufacturer’s specifications and are warranted to be free from defects in material and workmanship for a period of 12 months from date of sale. For more information, contact: Lisa Bemis Events & Promotions Supervisor, at lbemis@lbxco.com.